This 3 day Luxury Fly-in Chobe Honeymoon Package offers you a luxurious and romantic retreat into the heart of the amazing Chobe National Park. 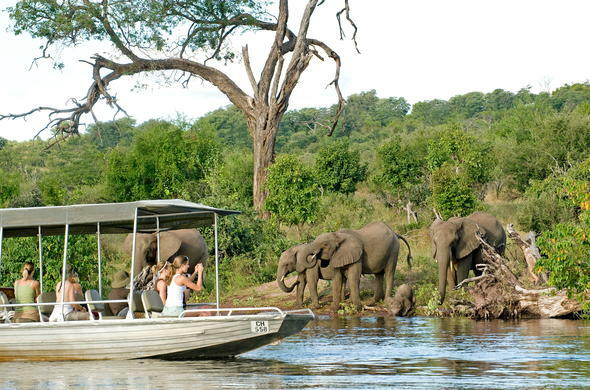 Activities: Game viewing boat cruises. Spa wellness treatments. This 3 day Fly-in Chobe Honeymoon package offers you a romantic escape in the bush that gives you the chance to see amazing African wildlife and stunning scenery. Reaffirm your commitment to each other while enjoying candlelight dinners, and soothing wellness treatments in the bush - this is African Romance at its most luxurious. Chobe is a legendary for having the world's largest Elephant population, and lots of other wildlife such as large herds of Wildebeest, Buffalo and Impala. On your Botswana honeymoon safari you will have the chance to see many predators such as Lion, Cheetah and Hyena while exploring this beautiful park. Activities include romantic boat cruises and dugout canoe safaris on the Chobe River, as well as further afield on game drives. Pamper yourself with indulgent spa treatments while looking out over the floodplains of one of Africa's great wilderness areas. These wellness treatments take place in a tree-house sala that offers you stunning views over the river. This is the ultimate African honeymoon. 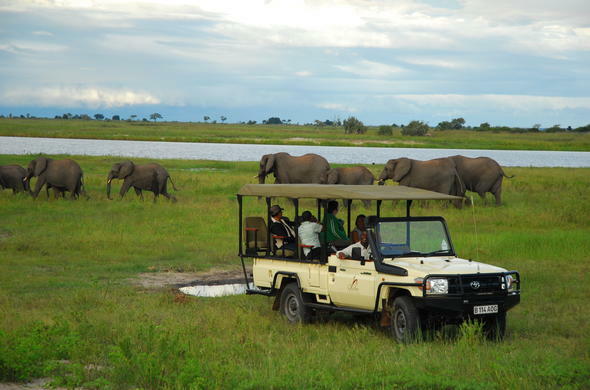 On the first day of your 3 day Fly-in Chobe Honeymoon Package you will arrive in Kasane from Johannesburg. From there you will take a road transfer to your safari lodge, which is perched high above the floodplains of the Chobe River. The view from the lodge is endless, and you will enjoy a refreshing lunch and have time to settle in to camp before heading out on your first game drive or river cruise. You'll see many Elephant, Zebra and Wildebeest as well as their attendant predators such as African Lion and Hyenas. You'll enjoy delicious sundowners and cocktails in a scenic spot, before returning to the safari lodge and savouring a sumptuous candlelight dinner. You'll have an early start to the day as you head out to explore the region and its wildlife. Game drives are conducted in open 4x4 safari vehicles and are led by exceptional guides, whose knowledge will add to the experience of your safari. The Chobe River offers stunning highlights throughout the year, with Africa's greatest Elephant concentrations during the dry season from June to October, and some of the best birding in Africa during the wet season. You may choose to relax at the safari lodge during the heat of the day, opt for a treatment in the exceptional spa, or head out on a motorboat to explore the Chobe River. Many animals come down to drink during the hot hours of the day, and viewing these animals from a boat is a wonderful experience. 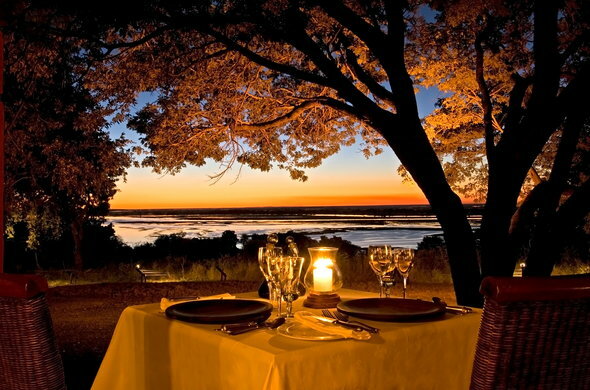 Enjoy sundowners and take in the stunning sunset before returning to the remote lodge for a romantic private dinner. On the final morning of your 3 day Luxury Fly-in Chobe Honeymoon package you will get the chance for one more amazing activity, during which you can have a last look at the Elephants foraging. Enjoy a delicious breakfast before your road transfer back to Kasane Airport, where you will catch your flight to Johannesburg O.R. Tambo International Airport. This Luxury Fly-in Chobe Honeymoon package is based on a 3 day honeymoon retreat for 2 guests sharing en-suite accommodation. This honeymoon package is all inclusive of meals and activities, scheduled flights ex/to Johannesburg O.R. Tambo International Airport with set departure days on Monday, Wednesday, Friday and Sunday in the late morning to Kasane and return flight to Johannesburg in the afternoon. This Botswana honeymoon travel package can be also combined with a stay in Livingstone (Zambia) or Victoria Falls (Zimbabwe) at the end. Rates may vary depending on the season and daily currency exchange rate.